From time to time the privilege arises to purchase a one-of-a-kind property, and this is it. 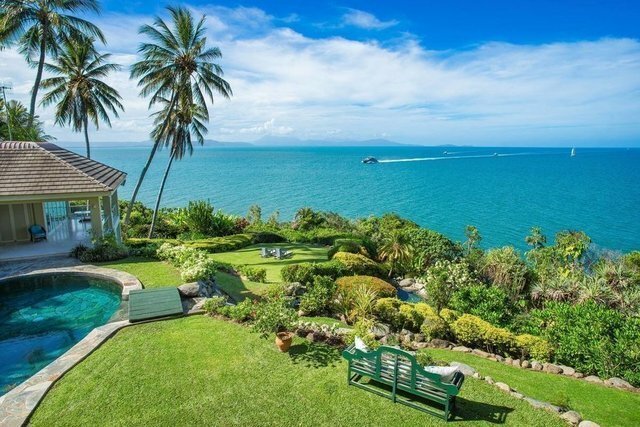 Introducing 1 Wharf Street, Port Douglas, an unrivalled north-facing oceanfront estate and exquisitely presented residence. Take a moment and visualise this tropical paradise setting with uninterrupted knock-out views that span across the bluest Coral Seas and greenest mountain ranges as far as the eyes can see. 1 Wharf Street was conceived as an uncompromisingly luxurious family home with the capacity to transform into a corporate retreat entertaining from two to more than 100 guests. Constructed 30 years ago to impeccable standards, the 940 sqm interiors underwent a contemporary makeover adding almost every conceivable modern convenience. Between the ocean edge and terraced landscaped grounds punctuated with natural stone gardens, manicured lawns and a freshwater stream, the double-storied residence with its grandly proportioned entry, spans over a U-shaped winged configuration: one wing to accommodate expansive living and entertaining areas; and a second for private family-living with guest bedrooms and a master residence. There are four guest bedrooms – three with an ensuite; and a secluded ground level master residence with north-facing bedroom and a luxuriously-appointed ensuite which adjoins a private living area and study. Over the two-levels, there are multiple living areas of generous proportions; expansive wrap-around verandahs, covered balconies and terraces for outdoor enjoyment; and two fully-equipped kitchens - one specifically designated for entertaining with an adjoining refrigerated cold room. The accompanying photographs and video complete the 1 Wharf Street story, so please peruse at leisure, envisioning yourself as its next owner.